Riding on the coat tails of last weeks “Progression of Apple” experiment, I decided to try something a little more involved; the Molecular Egg. This egg looks, feels, and acts under the normal properties of a sunny side-up egg, but tastes completely of mango and vanilla. 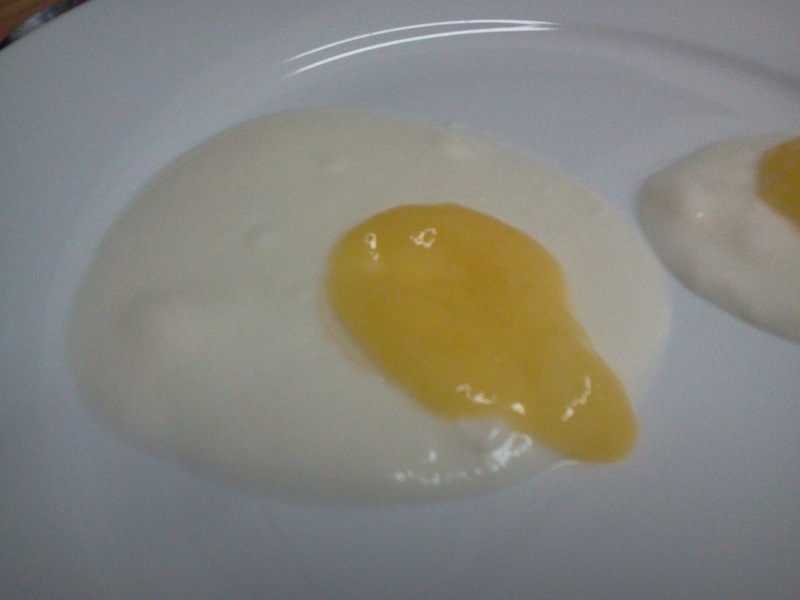 Molecular egg: Looks, feels, and acts like a normal egg, but tastes of mango and vanilla. I took 1/2 cup of whole milk, added 2 grams of Agar-Agar, and 1/4 teaspoon of vanilla extract to a pot and brought it up to 96 degrees Celsius. Once up to temperature, I removed it from the heat and let it sit for five minutes to cool slightly. I then promptly added the mixture to 2/3 cup of vanilla yogurt and poured a round disc on to a cool plate. 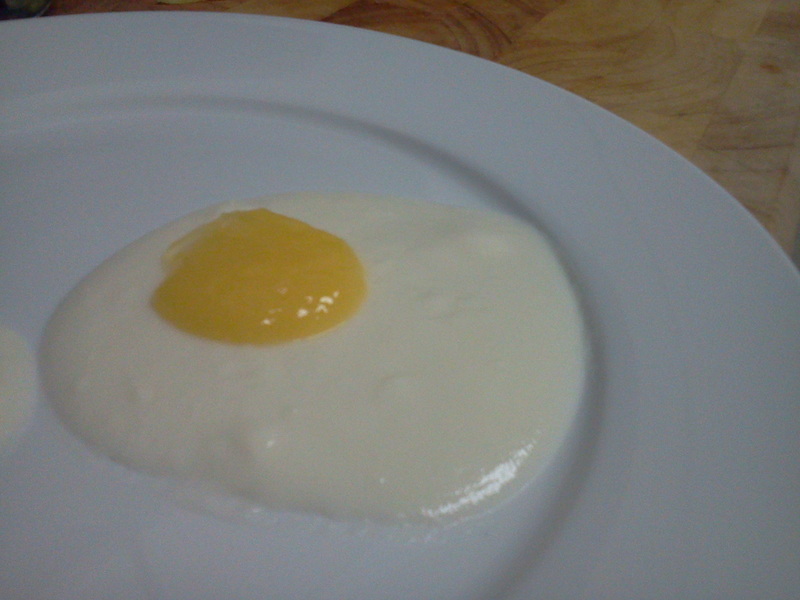 I then set the plate aside for at least 15 minutes while I prepared the yolk of the egg. The yolk is comprised completely of fresh mangoes and should mimic a real egg yolk in consistency and appearance only. To make it, I took 1 and 1/4 cups of freshly diced mango, placed it in a blender with 2 tablespoons of granulated white sugar and 1/2 teaspoon of Calcium Lacithin- then pulsed it until it was a smooth puree. In a separate bowl I took 2 cups of cold water, added two grams of Sodium Alginate and mixed thoroughly with an immersion blender. I then took a small round spoon, and scooped a spoonful of the mango mixture, placing it gently in to the Alginate bath. I let it sit for 3-4 minutes, before scooping each sphere out of the Alginate bath and in to a fresh cold water bath to rinse off. By now, your egg whites should be congealed, and set in to oval discs on your plate. Gently add a mango sphere just off-set from the center of the whites. This completes your egg. When you pierce the yolk, it should bleed just like a normal sunny side-up egg. Bleeds just like a normal egg.